Cornett, Dockins Claim five medals each. Weary, but happy, (l-r) coach Mary Fehrenbach and gymnasts Lee Dockins and Tonya Cornett returned from Abu Dhabi. It was a little later than they had anticipated, but on the afternoon of March 23, Special Olympics Kentucky gymnasts Tonya Cornett of Lexington and Lee Dockins of Russellville strode confidently up the concourse at Louisville International Airport, making all the commotion you’d expect from five World Games medals clanging around each of their necks. 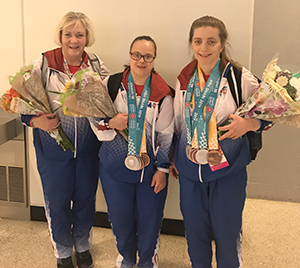 The pair, who had been training and competing together for nearly two years since being selected for the Team Kentucky delegation to last year’s Special Olympics USA Games, was returning from an incredible 17 days in Abu Dhabi where they maxed out their medal count at the 2019 World Summer Games. Cornett got on the board first as her competition began before the Games officially opened. When her events ended on March 15 – the first full day of the Games – she had claimed silver medals on the floor exercise and balance beam after improvements over her preliminary scores, and bronze medals in the vault, uneven bars and in the all-around. The five medals matched the total Cornett won at the USA Games in Seattle, and brought her lifetime World Games medal count to nine. She earned one silver and three bronze medals in rhythmic gymnastics at the 2003 World Games in Dublin, Ireland. Tonya Cornett won five medals, including bronze in the uneven bars despite being the oldest athlete in the gymnastics competition. Dockins had to wait until the end of the Games for her chance to compete. 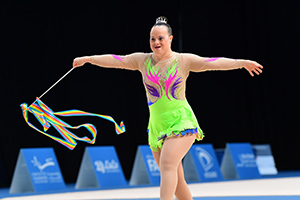 Dockins – the most decorated World Games athlete in Special Olympics Kentucky history as an artistic gymnast – was competing in rhythmic gymnastics at the World Games level for the first time. She excelled in her first effort, claiming three silvers and two bronze medals on the back of big improvements in the final performances. Her silver medals came in the ribbon, hoop and clubs, and the bronze were in ball and the all-around. The five medals bring Dockins’ eye-popping career total to 17 World Games medals in four appearances. She has also competed at the 2007 Games in Shanghai, 2011 Games in Athens and the 2015 Games in Los Angeles. She was honored last year as the leotard she wore in Shanghai was included in an exhibit at the Smithsonian’s Museum of American History which honored the 50th anniversary of Special Olympics. Lee Dockins added five more medals – including a silver in ribbon – bringing her career World Games medal count to 17. 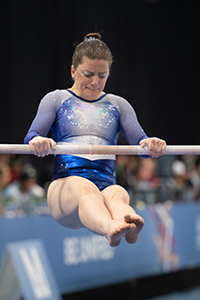 Fehrenbach once again served as the Special Olympics USA gymnastics head coach, the third consecutive World Games where she has held that role. She was also an assistant coach in 1999, 2003 and 2007. As busy as the competition was for our gymnastics contingent, it wasn’t their only activity in the United Arab Emirates. Upon arrival, Special Olympics USA headed to their Host Town of Dubai, an experience which included an amusement park trip, a visit to a school for children with disabilities and a visit to the US Consulate. Once in Abu Dhabi, the trip to the Games included a visit with Second Lady of the United States Karen Pence for the entire gymnastics team. Dockins did a TV segment with ESPN’s Julie Foudy – who had done the Fab Five story for the 2018 USA Games – and Lee was featured on the World Games wrap up broadcast on ABC. Most importantly, Cornett visited the Healthy Athletes venue and was fitted with and received new hearing aids which will transform her life for years to come. The next World Games will be the 2021 World Winter Games, which will be held February 2-13 in Åre and Östersund, Jämtland County, Sweden. The next World Summer Games are scheduled for Berlin, Germany, in 2023. For more information about the World Summer Games, or how you can support the Kentucky effort at future World Games, please contact President/CEO Trish Mazzoni at 502-605-8222 or tmazzoni@soky.org.